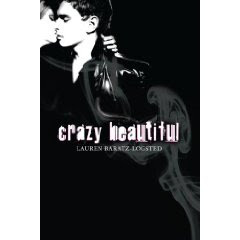 Crazy Beautiful by Lauren Baratz-Logsted. Houghton Mifflin Harcourt Children's Book Group. Publication date September 2009. Reviewed from ARC from ALA. The Plot: Two teens, strangers to each other, starting at a new high school. For Aurora, it's welcoming, all the kids like her, she doesn't have to worry about who to sit with at lunch. For Lucius, not so much. Not that he really cares; but the kids who say "hi" to Aurora shun Lucius. What's the difference? Is it that Aurora looks for the good in people? Is it that she is beautiful? Dresses perfectly? Is it that Lucius has hooks for hands? Oh. Yeah. Did I mention -- Lucius blew his arms off. But when wounded, isolated Lucius sees beautiful, sweet Aurora; and Aurora looks into Lucius's eyes; sparks fly. He's crazy, she's beautiful, can they wind up together? The Good: LOVED THIS. Love, love, love. Alternate chapters tell this story, first from Lucius's view, then Aurora; there are some clever overlaps, such as both are given pancakes and orange juice their first day of school, yet both have vastly different reactions to their breakfast. We see Lucius starting school, not expecting friends; Aurora starting school, nervous but expecting to like people and be liked. We also, from the start, see and feel the spark between these two. And let me tell you - H. O. T. There is attraction; and there is tension; but of course these two crazy beautiful kids cannot get together at first glance. See, Lucius used to have hands. Did up till a year ago. Back when he was a nerd, back when he was a science geek, and had a lab in his basement. An explosion; he blew up the house; and he lost his hands. His family is in a new house, a new town, trying to start over. And Lucius is trying to adjust to his new life; his life after. Aurora's life looks perfect from the outside; just as she looks perfect. But what people don't know is her mother died last year; a slow five years in the making death from cancer. What keeps her from being unbearably sweet -- unrealistically sweet -- is that she truly is nice. A niceness honed by loving her mother, caring for her mother, and being taught to look for the good in people. Which is why, when she looks at Lucius, she sees him as a whole person, not hooks. Had this been only Lucius's point of view, we may have never understood Lucius falling for her. By seeing her view, her way of looking at the world, how she lights up when sees Lucius, we know her and want these two to connect. This is an amazing love story, between two people you root for, who have realistic obstacles to overcome. But it's also the story of a very wounded teenager. Not just physically. Lucius's world exploded -- was destroyed -- because of something he did. Literally. And it's not just himself he hurt; while they escaped injury, he also hurt his family. They lost everything. He's working out what he did to his family; to himself; what type of person he is, after; what type of person he was, before. But it's not all love and angst (though there is plenty of both); there's also humor. Lucius has a younger sister: "mostly it's like [Misty] got the memo that kid sisters are supposed to be incredibly annoying and she follows those instructions religiously." But later scenes show a sibling bond that Lucius is either hesitant to admit to; or to guilty to acknowledge. Right, humor! Anyway, there are some scenes between Lucius and Misty that had me giggling. What else? So much else! Because I could also do a paragraph on the parents; and the school dynamics; on Lucius's friendship with the school security guard and his realization of what friendship means; and I haven't even mentioned the school play, Grease, and those gosh darn Australians. And it's not a long book! Baratz-Logsted does a beautiful job with conveying emotions, scenes, people with just a few words and lines. This is why I love young adult writers; they get to the point. They don't waste time with words that aren't needed and that take away from the story. Instead, it's the pure story that is told. Crazy Beautiful may be short; but it has more than enough to fall for Lucius, to champion Aurora, to know their friends and family, and, at the end, when the last final line is read, to turn back to the beginning and read it again. I guess I'll sum up this way: check the sidebar, because this is another Favorite Book read in 2009. I started this and then had so much going on I didn't finish it yet. Your review though makes me want to stop everything and read it right now! I'm always intrigued by how YA novels deal with the differently abled -- mostly the answer is "not." This sounds interesting. Okay, you sold me. I'll be looking for this one when September comes! I'm so excited for this when it comes out. I love all of Lauren B-L's work, and this kind of story twisted fairy tale is so up my alley! BTW, I met a friend of yours at a wedding a few weeks back. Very small world. Ooh! Added to my wishlist immediately! Wow, what a great review! I was already intrigued by this book, but now I know I'll HAVE to read it as soon as it comes out. Thanks for the recommendation!